The result of the Brexit vote has put the level of Northern Ireland's block grant from Westminster at enormous risk, Mike Nesbitt has warned. The Ulster Unionist leader said question marks over the £10bn-plus Treasury subvention emphasised the need to "create more wealth" within the region. As the latest party leader to address the Northern Ireland Chamber's 5 leaders, 5 Days series, Mr Nesbitt also expressed fear that the plan to reduce corporation tax to 12.5% in Northern Ireland was verging on a "busted flush". 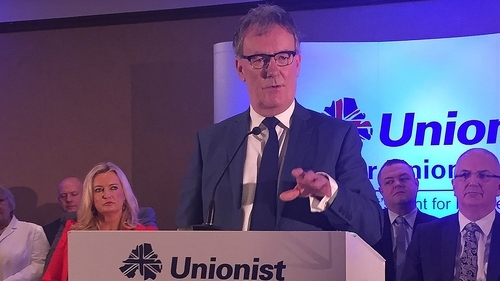 Pledging measures to boost the private sector if elected to a lead Stormont role, Mr Nesbitt told the audience of business representatives that the politics around the UK's vote to leave the EU had created huge uncertainty. "We should aspire to be less dependent on the block grant," he told the event at Diageo's offices in Belfast city centre. "If we are out of Europe because of English nationalists saying 'we don't want to give £9bn a year to Brussels', what's the logic - they are going to look at Scotland and say 'we are giving you over £10bn a year, and you don't want to be part of the UK, so off you go - we'll take that £10bn because that will build a lot of schools and hospitals and put bobbies on the beat and classroom assistants in the schools'. "And then where does that leave our £10bn? That leaves us at enormous, enormous risk. "So I think we should aspire to be less dependent on the block grant and that's why I talk about the need to generate really serious wealth." On the issue of the proposed corporation tax cut, a mainstay of the last Executive's economic strategy and once a key policy demand of the UUP, Mr Nesbitt suggested events had overtaken the plan. He said moves in Great Britain to cut the nationwide rate, combined with President Trump's protectionist agenda, had reduced the incentive offered to would-be investors by a 12.5% levy in Northern Ireland. "Now Theresa May says she wants the lowest corporation tax in the G20 - I am actually not sure what that is - and you have got Mr Trump saying he's going to slash corporation tax in the United States and he wants to repatriate jobs, so we need a whole new economic model," said Mr Nesbitt. "If our own rate of corporation tax isn't a busted flush, it's certainly pretty close to it and we need to think again about other policies."